Schools have already begin, but in that government school, the applications are still open. 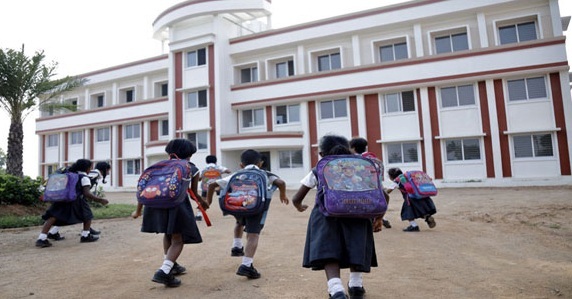 Parents are falling into school premises for entry to their children. 'please .. one seat' like asking . Keep doing some kind of 'reconciliation phones, all day long. This school is not a private or corporate school. It's a government school. However, this school has now increased the demand of the corporates to come up with an innovative campaign of teachers at the same time. The school is currently in the kothapeta of Prakasam district chirala. On December 19th, the construction work was completed and the classes were ready. "We have lots of seats. Do not come anymore, "the number of parent's has gone up to this ZP school. As many as 1,000 applicants have already received 1500 applications! What's the point of attracting such parents? The new school is ready at a cost of Rs 2 crore in 20 cents per acre. Courts are being prepared to play a vast field that can handle ten sports simultaneously. Mineral water plant is being constructed at a cost of six lakh.English medium will be taught. At the dining hall here, 450 children can eat at one time. Free transportation for those coming from distant places. Free bicycles for students. If you have admission in this school, students can not find any facility and accommodation. Chirala MLA Amanchi Krishnamohan is an adaptation of the eighth grade for his son. Upgrading the UP schools in the new pad and making it possible to set up high school with all hand. The idea was given by the government during the week. The works began on April 26th. Teachers fully cooperated in this regard. On the other hand, Minister Ganta Srinivasa Rao, Education Commissioner Sandhya rani, Collector Vinaychand and DEO Subbarao have come together in all walks of life. The donors came forward voluntarily.